One of the best reasons to visit San Juan is its world-class dining, which features everything from traditional Puerto Rican cuisine to creative fusion recipes from around the world. Dining in Puerto Rico's capital can be an expensive proposition if you're willing to splurge, or it can be deliciously affordable if you know where to go. Here are the best bargain restaurants in San Juan. You can find dishes here for under $10, including many of the daily specials. For those of you with large appetites, make sure to come on Sunday, when cauldrons of piping hot food are laid out buffet-style for patrons. I've mentioned Puerto Rican's love affair with the panadería already. These are great places to mingle, grab a bite for breakfast or lunch, and pick up some groceries for home. Kasalta, in Ocean Park, is a classic example, and one worth visiting for its extensive deli. Grab a seat at one of the cafeteria-like tables and go up to to the counter to order your choice of baked goods (the ​​quesitos come highly recommended) or a homemade soup to go with one of their many sandwiches. Follow it up with a slice of cake or another freshly made dessert and you have a cheap, quick, and simple meal. After a few days of mofongos, it might be just what the doctor ordered. Arguably serving the best burgers in Old San Juan, El Patio de Sam is a cozy spot ideally located just off the Plaza de San José. Don't be deceived by the dimly lit, rustic bar and dining space you'll see as you walk in. Rather, make your way to the back, where you can sit in the pleasant, sunlit patio and order your choice of Puerto Rican specialties, triple-decker sandwiches, and those huge half-pound burgers. In addition to the food, there's an array of creative cocktails on the menu (two favorites are the "Lady Killer," which is part gin, peach schnapps, Cointreau, and passion fruit juice, and the "Borinquen," which is a mix of Rum 151, passion fruit, orange juice, lime, and grenadine). 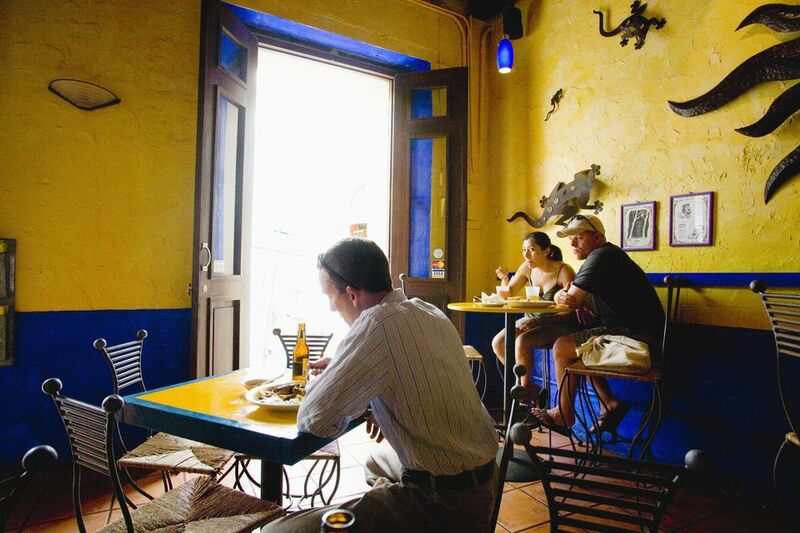 In Old San Juan, you can't get a more authentic Puerto Rican dining experience than La Fonda del Jibarito, or "El Jibarito" as it's sometimes known. The restaurant is named after the Jíbaros, the local, mountain-dwelling farmers who form an integral part of Puerto Rican society and culture, and it was started by one. Today, it's an old-fashioned canteen with hearty local fare served with minimal fanfare and plenty of taste. Criollo classics like chillo entero (whole fried snapper), chicharrones (fried pork chunks) and, naturally, a variety of mofongos can be found here. Continue to 5 of 5 below. In Santurce, the somewhat hidden Plaza del Mercado (your best bet is to take a taxi to get here) is a strictly local affair that hosts an open-air market once a week and a great, open-air block party on weekend nights. But it's also home to several down-home eateries known as fondas frequented by Puerto Ricans and few outsiders.